Los Cabos is the perfect destination for a gorgeous wedding on the beach. With miles of soft sand and breathtaking ocean views, there are endless options for unforgettable beach ceremonies in Cabo. We want our Cabo brides to picture themselves exchanging vows in front of their closest friends and family as the sun sets over the ocean. Of course, in order to inspire that vision, we’re sharing a few of our favorite Cabo wedding beach ceremony set-ups! 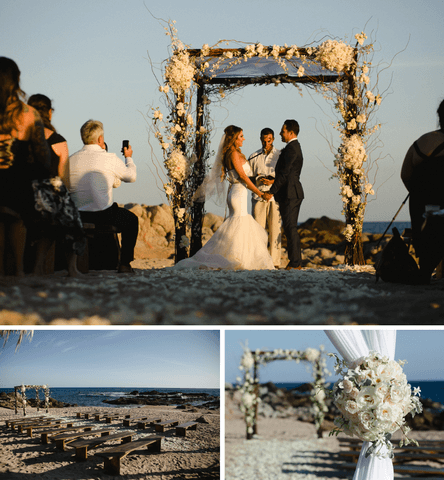 When we design beach ceremonies, our Cabo wedding planners work closely with our expert floral and décor teams to create a beautiful huppah. The ceremony huppah serves as a backdrop for the nuptials, and enhances the gorgeous view. Some of our favorite huppahs are simple and rustic, but we also adore elaborate huppahs! Oversized fresh florals, hanging greenery and lanterns are stylish ways to add a personal touch to the huppah and aisle. The aisle itself should complement the ceremony huppah. A few scattered rose petals work great for minimalist beach wedding ceremonies, but the options for aisle décor are endless. For more intricate beach ceremonies, a monogrammed aisle, large flower arrangements and floral aisle designs all add an air of sophistication to the set-up. Guest seating is another important element of a Cabo beach wedding. Our wedding planners know just the right seating to suggest for every couple’s style. Whether you love the look of rustic bench seating, dark wood or elegant Chiavari chairs, the team at Creative Destination Events has the perfect seating for your destination beach wedding! Since beach weddings mean sandy feet, we recommend choosing a shoe station where guests can leave their shoes behind while they attend the ceremony. Our planners will makes sure your shoe station coordinates with the décor style and signage of your beach ceremony. There’s nothing quite like a destination wedding on the beach in Los Cabos. With the right ceremony huppah, a gorgeous aisle to walk down, and all the amenities for your guests to witness your vows, your Cabo beach wedding will be a dream come true! Call the wedding planners at Creative Destination Events today to find out more about how truly amazing weddings in Cabo can be! This entry was posted in BEACH WEDDING, CABO WEDDINGS, DESTINATION WEDDINGS, WEDDINGS VENUES and tagged Cabo Beach Wedding Ceremonies.